Go to Backstage View by clicking File. You will see a list of different print options. Scroll to the bottom and click the link that says Page Setup. The Page Setup pop-up will appear. There are four tabs. Click the one that says Sheet. Select the checkbox that says Gridlines. Readers of Excel Basics In 30 Minutes may be interested to know that publisher i30 Media offers a product that can help them get the most out of Microsoft’s powerful spreadsheet program: The Excel 2016 Cheat Sheet. The printed version of the Excel 2016 Cheat Sheet is available for purchase on Amazon (or bulk order 20 copies here). It is also available as a downloadable PDF. Read on for a full description! Excel 2016 Cheat Sheet: What’s inside? Excel 2016 vs Excel Online. An overview of Microsoft’s Ribbon interface. How to add, edit, and hide data. How to use static cell references. Examples of basic formulas, functions, and AutoFill. How to perform simple math and calculate averages. How to sort and filter data. How to create a chart or graph. Universal keyboard shortcuts for Excel 2016. Note that the Excel 2016 Cheat Sheet does not cover advanced features of Excel 2016, the Excel mobile apps for tablets and phones, or other Microsoft Office/Office 365 applications. The four-panel reference is printed on 8.5 by 11 inch high-quality card stock, perfect for desks, walls, and shelves. It has holes for three-ring binders. The Excel 2016 Cheat Sheet was created by 30 Media, the publisher of the top-selling guides Excel Basics In 30 Minutes, Google Drive & Docs In 30 Minutes, and Dropbox In 30 Minutes. i30 Media has also published a Google Sheets Cheat Sheet. The Excel 2016 Cheat Sheet is an independent publication and is not affiliated with Microsoft Corporation. To order a printed copy of the Excel 2016 Cheat Sheet, visit Amazon. The PDF can be downloaded using this secure order form. There is also an option to purchase 20 copies of the printed Excel 2016 Cheat Sheet at 25% off the retail price, ground shipping included! I am posting a bunch of new spreadsheet files (Excel .xlsx format) that I described in Excel Basics In 30 Minutes. The files are useful for recreating situations described in the Excel book, such as creating simple functions (chapter 1), projecting earnings scenarios for our three coworkers Jennifer, Curtis, and Kara (chapter 2), as well as the autofill and human resources sorting exercises. The following Dropbox links will download to your computer (or prompt you to upload the .xlsx files to your own Dropbox account). If you are prompted to use a specific app to open them, choose Microsoft Excel 2016, Excel 2013, Excel 2010, Excel 2007, or any recent version of the Excel app or Excel for Mac. You can also upload the files to a Google Drive account to open/convert in Google Sheets. This short, five-minute tutorial will show you how to sort in Excel. It uses a simple, three-column spreadsheet file that shows the annual bonus amounts for employees in various departments. The concept is covered in “Excel Basics In 30 Minutes”, but it’s also useful to see it being done on the screen, as the video below shows. Sorting is a very useful way to alphabetize lists, rank lists from highest to lowest (or vice-versa), or sort by multiple criteria (in the video below, department is the key criteria, followed by amount of the bonus). However, sorting can be a tricky thing, too. A common mistake is failing to “expand selection”, which means only one column will be selected for sorting. The result? The data will be mixed up because the other columns weren’t sorted at the same time. This type of mistake has led to people being sent the wrong mail, as well as financial errors. Don’t let it happen to you! For more information about sorting and other basic Excel functions, read “Excel Basics In 30 Minutes”. It’s inexpensive — less than the cost of a pizza! Go to this page to see reviews, and this page to place your order. Video tutorial: Sorting Please “Like” and share after you watch it! If you’ve ever wondered how to export an Excel chart to a JPG, PNG, GIF, or other file format, the following two-minute video shows how, using a simple right-click over the image and selecting “Save As”. Note that if you don’t see the “Save As” option, select “Copy” instead. Then, open up Paint or any other image editor and paste the image, then save it as a JPG, PNG, GIF, etc. The narrator of the video is the author of “Excel Basics In 30 Minutes”, a guide that contains many more tips and how-to instructions that will get you up to speed with Excel in no time. Visit this page to see purchasing options for “Excel Basics In 30 Minutes”. If you work with data, you’ll eventually have to deal with CSV files. This short video explains what comma-separated value files are, and how to convert CSV files in Excel. Several examples containing text data (in the form of a list of first and last names, as well as a CSV download from a banking site) are shown being imported into Excel and flowed into the spreadsheet cells. 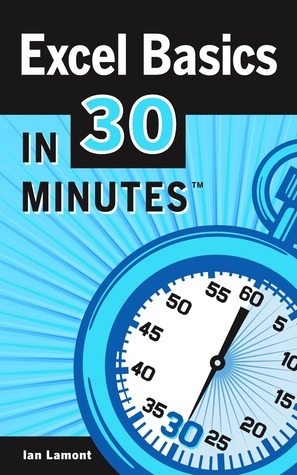 The narrator is Ian Lamont, author of Excel Basics In 30 Minutes and other In 30 Minutes™ titles. Press the icon in the lower right-hand corner of the screen to see the video in all of its full-screen glory. Earlier this month, the Goodreads Giveaway for Excel Basics In 30 Minutes was officially launched. As of this writing, the registration is still open. For the next two weeks, you can sign up for the giveaway and have a chance at winning one of 25 free copies of the paperback (126 people have already signed up). The details to join the giveaway are at the bottom of this page. However, one thing I wanted to highlight about the giveaway was the impact of the listing on the sales and marketing of the book. I track marketing data very carefully. Shortly after the Goodreads Giveaway was launched, there was a measurable increase in the number of books sold on Amazon and iTunes. In addition, I saw on the Goodreads Giveaway listing page that about 30 or 40 people had listed it as “to-read”. My hypothesis: People who saw the giveaway wanted to mark it for future reference, and in a few cases they wanted it right away — and went to Amazon or iTunes to buy the ebook version. Several people also bought the paperback version. This is not a best-selling In 30 Minutes™ title, but the boost was welcome. I’m looking forward to the end of the promotion, and sending out the free copies to 25 lucky winners (selected by Goodreads). I’m also looking forward to getting feedback from those readers. Giveaway ends April 11, 2013. In six minutes, learn how to convert .xlsx files to Google Sheets, a free online spreadsheet program that is part of the Google Drive office suite. If you have Excel 2010 or 2013, this is a way to get the files into Google Drive. The technique also works with .xls files in older versions of Microsoft Excel. Three examples are given, with step-by-step instructions of how to handle the conversion process. There are also some warnings about formatting problems which can occur when the Microsoft Excel documents are imported into Google Drive. Start the video below. To see the video full-screen, press the icon on the bottom bar of the video. The narrator of the video is the author of Excel Basics In 30 Minutes, which you can buy here for the Kindle, iPad, or Nook, or download as a PDF. There is also a paperback edition available.